UAD – APPRAISER – Certification or License Number – ASC.gov license check is incomplete. Manual verification may be required. We’ve been notified that access to ASC.gov will be intermittent through Sunday, July 16, 2017. To keep you informed we will post updates to aciweb.com and social media as more information becomes available. 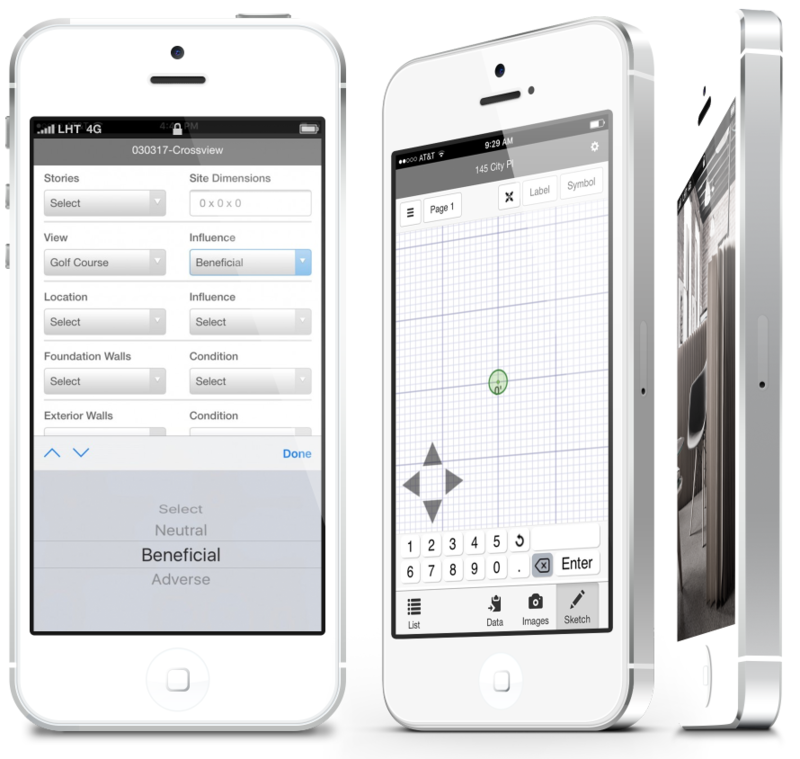 Sky Inspect allows you to collect data, take pictures and draw a sketch on site without using your mobile data plan. Make a shortcut to Sky Inspect by using your devices Add to Home Screen function. These steps differ for Android and iPhone. Launch Chrome and log into your ACI Sky account. Once logged in, tap the hamburger menu in the upper left and select Inspections. When the page opens tap the ellipse icon at the top right of the browser. Select Add to Home Screen and tap Add, and voila — your very own icon that you can add to your device. Launch Safari and log into your ACI Sky account. When the page opens tap the “send to” icon at the bottom of the screen. Select Add to Home Screen, and voila — your very own icon that you can add to your device. 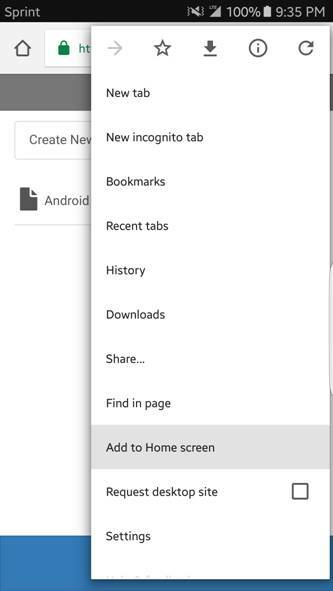 Once the icon is available on the home screen, you can close the browser and use the Home Screen icon to access inspections. Tap Create New to start a new inspection. 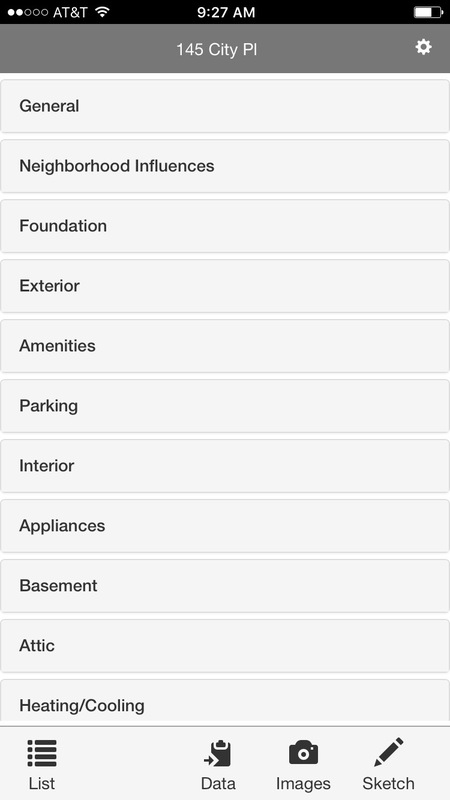 In the Name field, enter the file name for the property you’re inspecting and tap Create. Press on the file name to open the inspection, or select the ellipse to Rename, Delete or Sync. Delete will prompt for confirmation before removing it from the device. 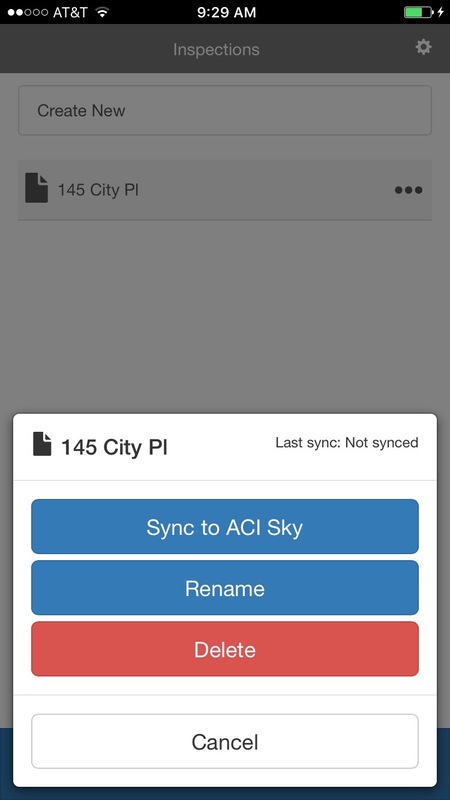 Sync to ACI Sky will sync a single inspection from the list view to Sky Report. Note: Once synced, photos are moved to Sky Report and not displayed on the inspection tool. You can view them by tapping on the image slot using your data plan or internet access. Tap the new Inspection that you just created to open it. Once open, you’ll see a list of sections – this is the Data view. Select a section and fill out all of the applicable fields, then continue on to the next section. Select Yes or No from the toggle to indicate items like Neighborhood Influences. Note: Leave items as “No” or “Select” if it does not apply, or you do not want that data to import into your report upon syncing. Continue on through each section adding comments where applicable. Note: Once the inspection is synced, comments will display in the sidebar of Sky Report for reference. You can then copy and paste the data into the desired comment area. At the bottom of the screen you can navigate to Images, Sketch or return to the inspection List. Select Images to start taking photographs. 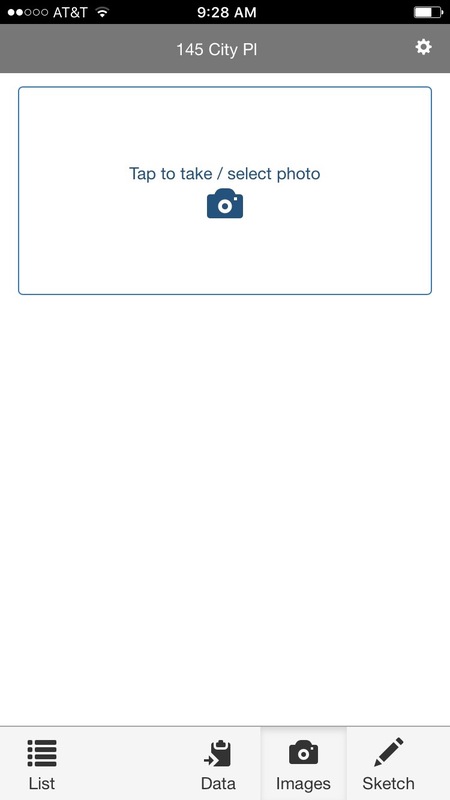 Tap an open photo slot to take a photo with the devices camera or load an existing photo from your gallery/camera roll. Tap the arrow beneath the photo to select the appropriate label. Note: Upon syncing, unlabeled photos will need to be manually placed in the appropriate photo slot. Labeled photographs will map to the appropriate slot upon import. Repeat steps 1 and 2 until you’ve completed the photo collection process. To delete a photo, select a photo and tap Delete. Select Sketch from the bottom navigation. 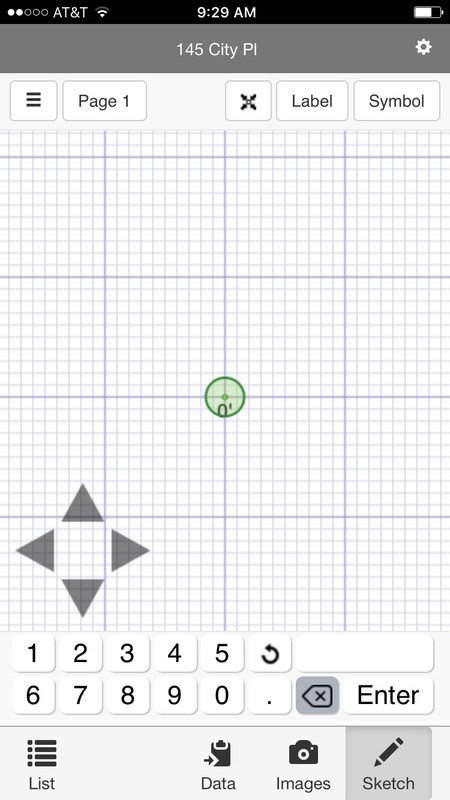 The Sketch screen displays with green circle. Note: A green circle means you’re in draw mode. To start drawing, enter in the wall length on the keypad, then tap the directional and tap Enter to lock in your line. Continue this process until you’ve closed the area. The Define Your Area pop-up displays. Choose the applicable area type from the list and tap OK. The Sketch screen displays with the area defined. To make a new area, tap the grid where you want to start then hit Enter. You must use your data plan or Wi-Fi connection to sync your inspection. When finished with the inspection, tap the “List” button in the lower left corner. 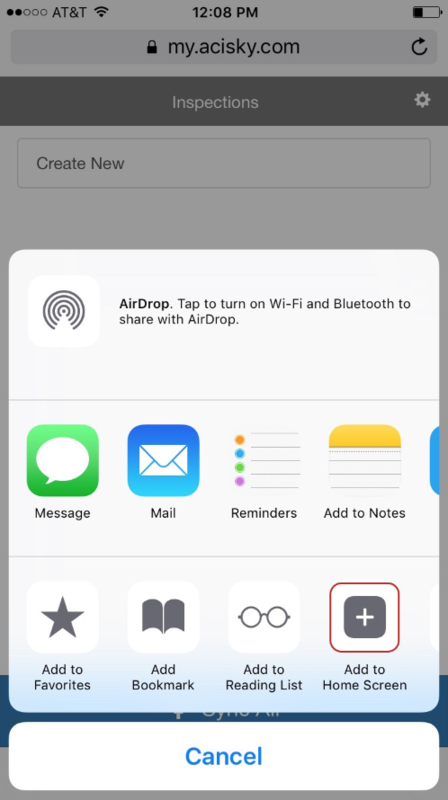 You can sync multiple inspections with the “Sync All” button at the bottom of the screen. Note: To sync a single inspection select the ellipse icon next to the file name, and select Sync. If you were offline, the Sync button will bring you to the ACI Sky login page where you can sign in using your ACI Sky credentials. Once the sync is complete the cloud icon on the “Sync All” button will change to a checkmark. 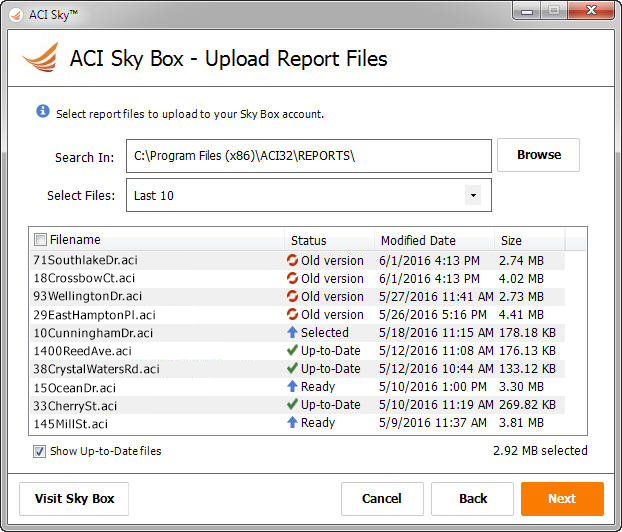 To import data from your synchronized inspections into a report, log into ACI Sky in a web browser. Create or open an existing appraisal report file, then click View > Inspections to open the list of available inspections. The list will appear from the right side of your window. Clicking the cloud/down arrow icon to the left of an inspection name will allow you to import that inspection’s data to the current Sky Report. You will be prompted to confirm that the data from the inspection will replace the existing data in the report. Alternatively; clicking on the inspection name will allow you to view and import only what you want from that inspection. Click the section names to expand and collapse each section. For example, if you click General, it will expand to show items like Address, Property Type, room counts, and other General data elements. When an Inspection is expanded the following buttons are available. Delete will prompt for confirmation before removing it from your list. Import Data – Select this button to sync only the data from the inspection. Import Images – Select this button to sync only the images from the inspection. Note: Images that are not labeled will not import. You can manually drag and drop them into the report. Any images that were synchronized from the device in ACI Sky will only exist in ACI Sky, so adjust your workflow accordingly (i.e. take offline photographs via your devices Camera app to store images locally on the device, apart from ACI Sky and Inspections). Import Sketch(s) – Select this button to Sync only the sketch images from the inspection. For assistance contact the ACI One Call team via email at onecall@aciweb.com or by phone at 800-234-8727. 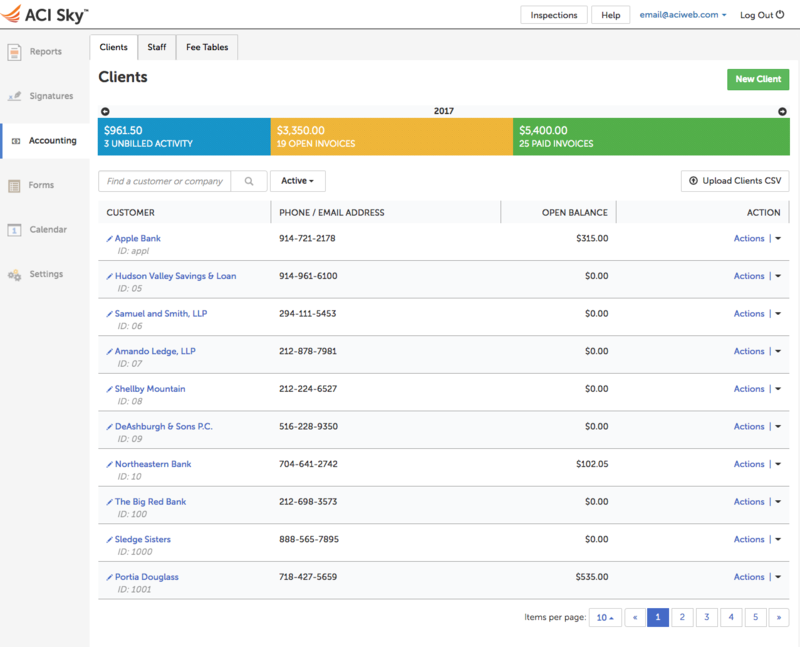 ACI Sky’s new accounting feature brings office management to the cloud. Users now have the ability to manage clients and appraisers, generate invoices, post payments, track accounts receivable, and manage fee tables. Click the Accounting tab in the ACI Sky navigation panel. The Accounting dashboard displays the current balance for orders with an amount due, delivered orders awaiting payment, and paid orders. Unpaid balances are listed per client name and code. Click the Actions drop-down to print invoices and post payments. The accounting section allows users to add, and edit both clients and appraisers via the Clients and Staff tabs. You can add individual members by selecting the green “New Client” or “New Staff Member” button accordingly. A bulk upload option is also available, by importing a CSV to the data table. Clients and Staff Members added to this section will be available when entering a new order for quick selection. Clients can be disabled to remove them from the main list view during order creation and editing by clicking the Delete button. Deleted clients can be restored by searching “All” or “Deleted” clients and selecting the Restore button in the Client Information modal. Clients can be permanently deleted as well, to formally remove them from the database. The same rules apply to managing appraisers in the Staff section. 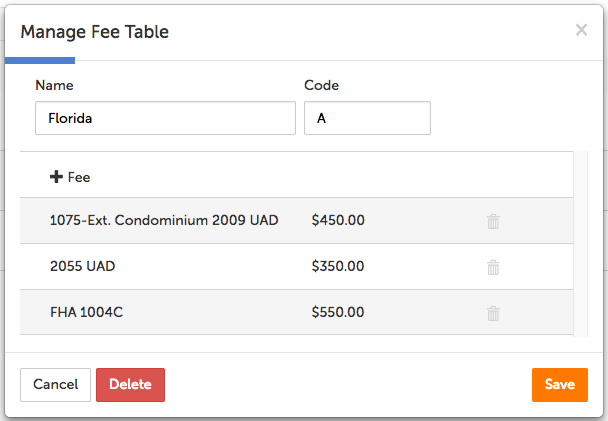 Fee tables can be created and edited via the Fee Tables tab. Each fee table can have a name and code, as well as a list of job types with a value assigned to each. 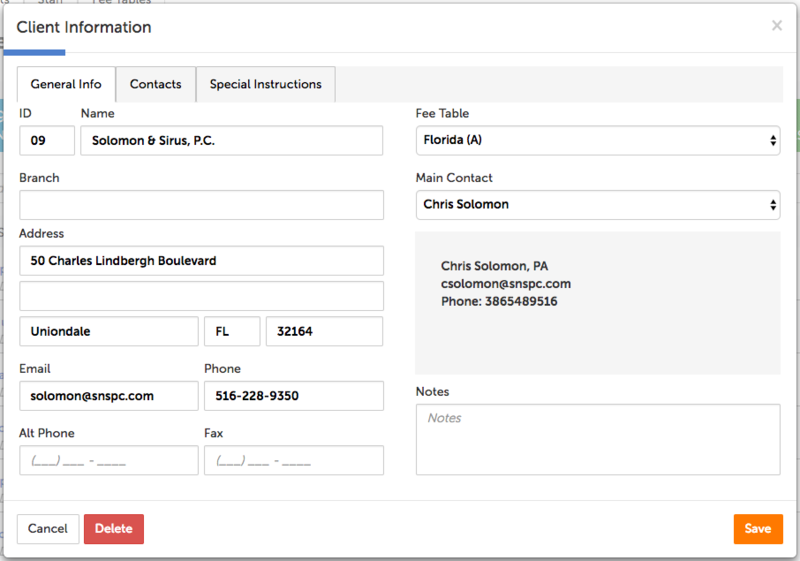 Fee tables can then be assigned to clients via the Client Information modal. Some of the shortcut keys available to you in Sky are listed below. Review the chart showing the connected key strokes and their functions. How Can I Use Sale Price to Calculate Adjustments on a LAND Form? To use Sales Price to calculate the Comparables Adjusted Value on a LAND form, you need to change your Report Options. 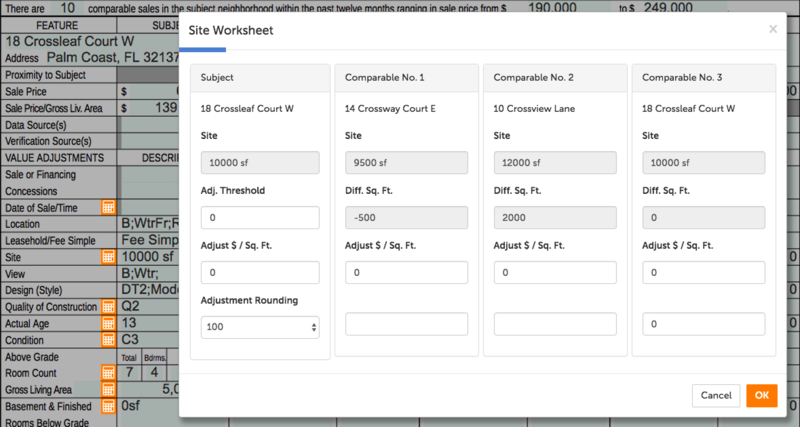 By default the land forms are set to use the line for “Price per” so that you can calculate adjustments by the appropriate unit for the property (sq ft, acre, front foot, etc). If you prefer to calculate adjustments based on sales price, you can easily switch this option. Simply open the land report and then from the top menu select Options > Report and click the + (plus) sign next to the appropriate Land form (Land2, Land_10, Land_15). Select Sales Comparison Analysis and select the radio button for Sales Price. Click OK to accept the changes. Select Apply to Future Reports Created with Default Options to use this option for future reports. To apply settings to an existing template, edit the template and select the option. 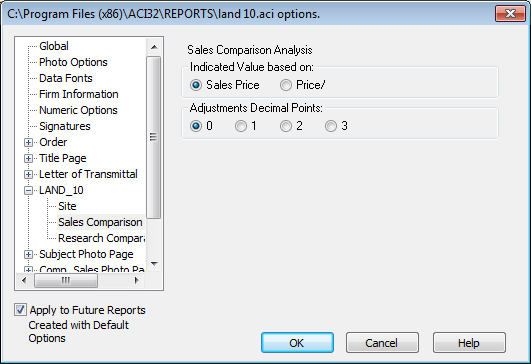 When creating a new report, select Use Default Report Options to use the default options.